There are six diverse projects in each booklet. *Hitches up onion belt* Now back in my day, our papercraft activity books just folded up into something pretty. And we liked it that way. But you kids, with your Nintendoodads and Snapcharts, well that just isn't good enough, is it? No, your paper-based projects have to employ all sorts of electrical circuits, teach STEM skills, make music and ok this is actually pretty cool. Dubbed "Papier Machine", this interactive booklet is actually a compendium of six electronic toys that you can tear out, assemble and play music with. Each page is silkscreened with conductive silver ink (similar to the stuff used in touchscreen-enabled gloves) and the entire kit includes everything else you'll need to complete each activity: button cell batteries, a tiny sound chip, piezoelectric elements and so on. 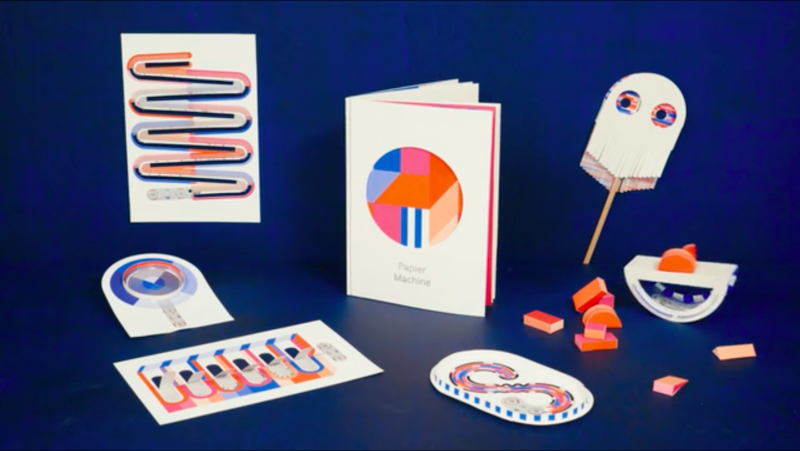 With the Papier Machine book, you'll be able to create a basic working keyboard, race magnetic marbles around a gyroscopic racetrack, build a paper wind chime that plays evolving electronica melodies, and a whole bunch more. The booklet is currently an ongoing Kickstarter project (having hit $34,000 of its $55,000 funding goal as of the time of this post's publication with 33 days left). Each kit is going for €35 ($43) as part of the project's early bird pricing. Should it fully fund, the company hopes to begin shipping product to backers starting July, 2018.